Beauty News: AirOptix Colors Play Day is Coming!!! OMG!!! OMG!!! May paandar ang AirOptix this July 15. AirOptix at Php500?! CRAAAAAY!!! 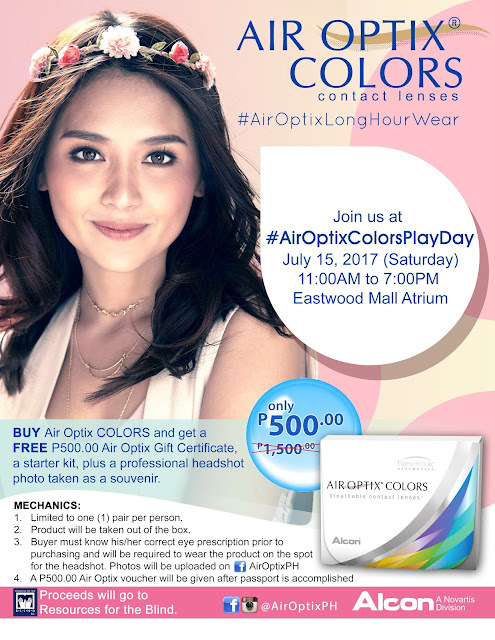 For ONE DAY ONLY, Air Optix Colors will be P500.00 instead of P1,500.00 and it comes with a FREE P500 Air Optix GC, activities at the event and a lens starter kit. This will be at July 15, 2017 (Saturday) 11am to 7pm at Eastwood Mall Atrium. The event will be featuring a photo gallery of influencers representing each Air Optix Colors shade. Beginners or those who have never worn lenses can learn from experts and doctors present at the event, and of course current eyeglass wearers can switch to Air Optix Colors and experience breathable color contact lenses as a fashion alternative. AIR OPTIX® COLORS contact lenses offer a more comfortable alternative,3 which gives current wearers of FreshLook® color contact lenses an upgrade in breathability with the same beautiful 3-in-1 color technology. 1.) Limited to one (1) pair per person. 2.) Product will be taken out of the box. 3.) Buyer must know his/her correct eye prescription prior to purchasing and will be REQUIRED to wear the product for the headshot. Photos will be uploaded on Facebook. 4.) A P500 Air Optix voucher will be given once the passport stamps are completed. *All colors and grade (eye prescription) are available but stocks are very limited so be sure to come in at 10am to make sure you get your desired pair!